Get your mitts on our finest issue yet this Saturday at our PDX Magazine No. 8 Release Party. It’s at Ford Food + Drink (2505 SE 11th Ave) from 7:30 to 10 p.m.
We have two remarkable Portland writers who are also renowned performers in the lineup: frequent contributor to the mag Famous Author Mykle Hansen as well as poet Leah Noble Davidson, whom we covered in our very first issue of the magazine. Both will ply their literary talents before you. Wander by, meet the staff, hobnob with the many contributors to the mag, get those back issues you’ve missed, and most importantly, pick up a copy of No. 8. When I claim No. 8 is our finest work yet, I’m not being the slightest bit hyperbolic despite the seven stupendous issues that precede this one. 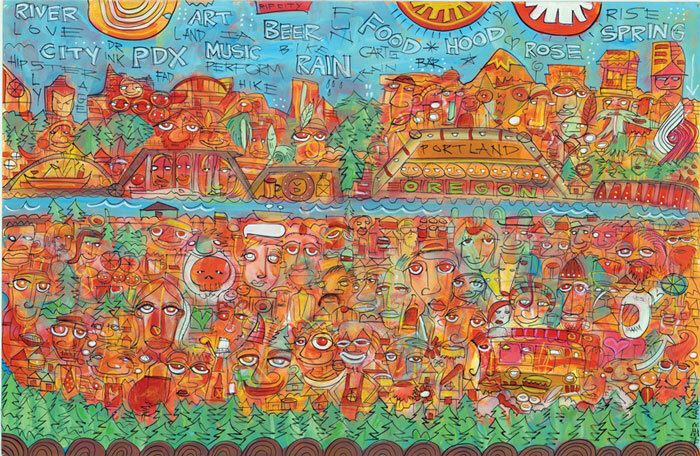 Number 8 features a Portland cityscape painted by Chris Haberman (see the image above). At the magazine’s center spread is a removable art poster of this painting minus all the identifying marks we need to put on the cover version. Also, writer Mike Allen falls in with Portland moonshiners, Leo Daedalus survives the world’s most dangerous drinking game. Not that our content is booze-heavy this month, but Mugroso adds to the seemingly Sybaritic theme with his piece on Portland’s urban wineries. On an oh-so-slightly more sober note, we report on AFRU Gallery’s circus-themed May exhibit which kicked off with a memorable carnivalesque party. And there’s even more art: new paintings from Ken Sellen and Eli Lewis; sculpture from Scott Foster and Corbett/Kathryn. Finally we report on the break-out band Minden and feature poetry and illustration from the Street Roots anthology I Am Not a Poet. P.S. If you happen not to live in Portland, or if you can’t make it by the release party, you can still enjoy our magazine. We will mail to your door for a meager $3 per issue. Just visit www. PDXMag.com/Membership to get yours.